Usually I love IHOP but the one opposite the Hilton was disappointing in the extreme and so I stuck to Denny's after that. One morning I got up at 6:30am and bought breakfast, second breakfast, lunch and dinner to go, stacked the fridge, went for a swim, picked up my breakfast and then headed to the outlet queue downstairs in the Hilton. One hour of shopping later I popped back to my room for second breakfast before remembering I had Wally's master class and probably shouldn't eat at all. The poolside restaurant at the Hilton is also good, and their other lower level restaurant does a massive buffet breakfast for $24 but once you add on service etc. 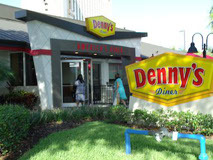 it really does pay to walk across the road to Denny's. Also the best coffee is to be found made by a man called Julio at the Peabody Express café.